Sometimes leaders think that if they just push and pull people hard enough, they'll do what they are supposed to do. What they fail to realize is that if they help people "be" who they should be, people will tend to "do" what they should do. 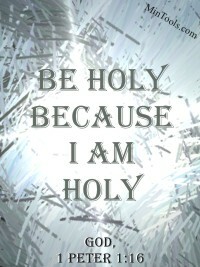 Holiness begins on the inside and works its way out. Holiness begins as an inward reaction toward what God has done according His grace and mercy. When leaders take a heavy-handed approach toward holiness, people tend to feel burdened down, oppressed, and condemned. -- That's legalism. A hands-toward-God approach, however, is a Christ-like approach leading to rest, freedom, and deliverance which leads to holiness. -- That's grace. Holiness should not seem burdensome. Legalism puts a burden on people that is too hard to bear (Lk. 11:46). Leaders should be helping people, not further weighing them down. Holiness should not seem oppressive. Legalism enslaves people. Rather than being yoked to Christ, they are yoked to a rigid standard that makes people keep trying harder and harder and never getting released. Leaders should be warning people to steer them away from such bondages which stand contrary to life in Christ. Holiness should not seem like condemnation. If God's grace is both the motivation and means for people to become holy, what, then is the leader's role? Should leaders take a hands-free approach? To the contrary, leaders should be quite proactive in helping the church become holy and blameless according to God's heart. A Hands-Toward-God Approach Leads Toward Holiness. Pray for the people you serve. Be an example not only of holy conduct but also in depending on God's grace to get you there. Help people get beyond living for the moment by presenting a big picture perspective. Help people more fully understand God's grace and mercies and disciple them on where that should take them.